This is an album of scanned slides mostly from the 1970's, but several from 1980-2001, of various bicycle subjects that have to do with Grizzly Peak Cyclists (originally called Grizzly Pedal Pushers), a bicycling club based in the East Bay. These are not photos from a trip to France, nor just a record of GPC Centuries, but rather 40 years of snapshots. Since I used slow color slide film and have scanned several thousand slides (and a few negatives as well), including Vietnam war protests, People's Park demonstrations, camping trips, and other subjects, the photos are frequently not sharp and some are contrasty. But the images bring back the time. More images will be added as we scan slides from the 1980's and 1990's. 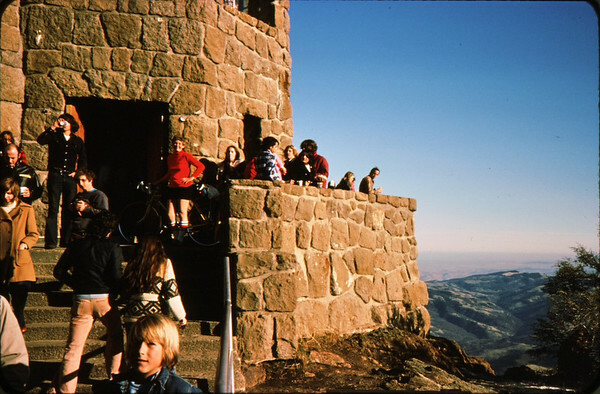 carole dwinell (in red), charles larribeau (far right) There was still a snackbar in the tower. I would find a isolated hall and change into a dry jersey for the ride down. Speed could get out of control and crashes in tight turns or on gravel common.